Our complete decking calculator & guide can help you understand which supplies you’ll need to an accurate level, helping to reduce wastage & increase project efficiencies. e, you’re almost ready to begin with your build. Hopefully you’ve carefully considered your design & garden layout; you’ve found a fitter or committed yourself to a DIY build; and you’ve chosen the primary materials you’d like to use for your decking boards. It’s now time to understand your specific requirements so that you can plan your labour & material requirements. None of our calculations or estimations allow for wastage – so it is recommended you add 5-10% extra in supplies to account for this. Our calculations also won’t give you a price for your materials – this depends completely on your supplier & the quality of materials you opt for. What our calculations will do is help you to understand your material requirements so you can source these from a trusted supplier. – What if my deck isn’t rectangular? Calculating the surface area of your deck is actually fairly straight forward. It’s a simple formula that you might remember from Maths class! What if my deck isn't rectangular? If your deck isn’t a simple rectangle, it’s no problem. You can simply break the various sections of your proposed deck into individual rectangles which can be easily measured individually & then added together to understand your overall requirements. Once we understand our total square metre requirements, we can then use this number to calculate how many boards we’ll need for our build. The frame of a deck is usually constructed from pressure-treated softwoods which are both durable & affordable. The framing is mainly made up of the decking posts, which secure the structure; supporting beams, which add structural stability; joists, repeated lengths of wood which are used to support the boards; ledger, used to fix the structure to a building; and various hangers & nails which help bolt everything together. You can calculate your requirements for each of these with some simple calculations. 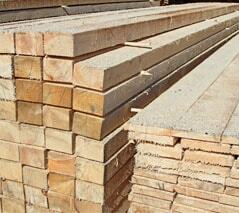 Support posts are the treated wooden members which are fixed into the ground, usually with concrete. They give the deck its rigid stability. Experts recommend that support posts should have a centre spacing of no less than 1m and no more than 1.5m. Put in layman’s terms – the space from the centre of one post to the centre of an adjacent post should be no less than 1m and no more than 1.5m to ensure stability. It’s recommended that you should screw two support beams onto every post along the longest length of the deck. This helps to give extra strength to the deck. The recommended spacing between joists depends on whether you intend to position your boards horizontal or diagonal. The centre spacing between joists for horizontal boards should be 400mm, while the spacing for diagonal boards is slightly less at 300mm. The ledger can be calculated very simply by measuring the length of the decking structure fixed against a building. You will need to buy a sufficient number of joist hangers & galvanised nails for your build. You will also need a plastic weed barrier measuring the total square area of your deck. To calculate the number of boards required for your build, you’ll first need to understand the total area you need to cover. We can then use some simple calculations using the width of your desired boards to understand how many will be needed to cover this total surface area. Once you know the overall surface area of your deck & the width of your chosen boards, you’ll be able to calculate how many decking boards you’ll need for your build. You may actually require 5-10% more in boards to account for wastage. Important: our calculations don’t account for spacing between boards. While this is not a problem for wooden boards (which will naturally shrink after installation anyway, so don’t require spacing) you will need to consider this for PVC & wood-plastic composites, where spacing is recommended. See your installation guidelines for more information. Want the best price on your decking boards? Our experts have compared over 20 UK suppliers of garden decking boards, so you don’t have to! We can use a standard perimeter calculation to understand the amount of railings required for a decking build. Again, if you have an unconventional shape for your structure, you may need to calculate the length of all sides with railings & add these together. Remember that you will need to buy both rails & balustrading/newel posts for your build. Retailers will be able to advise on how many of these you will likely need for the length of railings required.